Peter M. Garnavich, professor of physics at the University of Notre Dame, and Brian Hayden, a physics graduate student, are members of the CANDELS+CLASH Supernova Project that recently discovered a supernova that exploded more than 10 billion years ago. The Type Ia supernova, part of a class used for measuring the expansion of space, is the farthest yet found by NASA’s Hubble Space Telescope. Garnavich and Hayden are co-authors of a paper announcing the discovery, which has been accepted for publication in The Astrophysical Journal. Since 2010, Hubble’s Wide Field Camera 3 has surveyed faraway Type Ia supernovae to determine whether they have changed over the 13.8 billion years since the Big Bang. The Cosmic Assembly Near-infrared Deep Extragalactic Legacy Survey (CANDELS) and the Cluster Lensing and Supernova Survey with Hubble (CLASH) have studied thousands of galaxies. 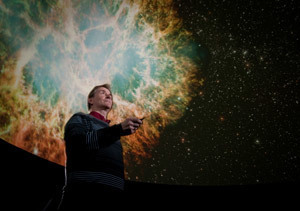 “We realized that in building up the deep images, we could take data every few months, and by staggering the visits we could search for fresh exploding stars,” Garnavich said, adding that Hayden’s dissertation is on the study of Type Ia supernovae. “Brian and I have great fun searching for supernovae in the Hubble data, and we have personally found a few. We have also contributed to the ground-based follow-up studies including observations with the Large Binocular Telescope (LBT).” The LBT, which is partly funded by Notre Dame, is one of the largest telescopes in the world. “These supernovae are important tools for studying the dark energy that is speeding up the expansion of space,” said census leader Adam Riess of the Space Telescope Science Institute in Baltimore and Johns Hopkins University. “This study gives us a chance to ‘stress test’ the supernovae themselves to test how well we understand them.” Reiss, who won the Nobel Prize for his discovery of the accelerating universe, and Garnavich were member of the High-Z team, one of two teams that discovered the acceleration using Type Ia supernovae. The supernova is named SN Wilson after President Woodrow Wilson. The CANDELS+CLASH collaboration has found more than 100 supernovae, including SN Wilson, 350 million years older than the previous record, and seven other Type Ia supernovae that exploded more than 9 billion years ago. Among other things, the study has provided evidence that supernovae result from the merger of two white dwarfs, rather than the explosion of one white dwarf that was feeding from another. Understanding supernovae explosions can also provide insight into the nature of dark energy and the production of iron and other heavy elements in the universe. Originally published by Gene Stowe and Marissa Gebhard at news.nd.edu on April 09, 2013.